I am married to a wonderful man we have no children. We do have two cats and a service dog, they are our children. Some of my hobbies are reading, knitting and murder mysteries are my favorite shows I love gospel music, classical music, and relaxation music. I like to color too either on my phone or physically with a coloring book and pencils and besides that, I also like deep sea fishing with my husband on a boat. I am a Christian who loves the Lord and is praying that I will succeed in this new adventure for earning money online. I am here to make extra money because I am tired of living paycheck to paycheck. I am looking to living comfortably once again with no worries. Things are difficult and I needed to go back to work but due to health issues I can't work outside the home so this is the best thing for me to do that I can work and still be able to take care of my family. I am excited about this new adventure I am going to need a lot of help with the business to do it right. I have never done this type of work and I really don't know what I am doing. My prayers go out to everyone that is in the community and I pray for myself that I will succeed at this new adventure as well. With this new adventure and this new chapter in my life, all my dreams will come true through hard work, determination, persistence, and passion. Since I originally wrote my bio alot of things have happened in the past 6 months. I had a stroke and my migraines headaches have come back but I have recovered from the stroke and the headaches are under control once again. I wanted to update my bio by saying this last year has been a roller coaster for me but I am still here going strong. I am so thankful and grateful to the community/family because you have all been so supportive and very helpful. This had been a godsend. for me because I was beside myself how I was going to work and not be stressed out and when Wealthy Affiliate came into my life this was a message for me from God and when one door closes another one opens up. This platform is going to give me that freedom that I am looking for to try and do new things in my life and I am really excited about it. I believe in that things happen for a reason and this came at the right time for me. I hope you are doing better in that regard. I talk about my overcoming retinopathy on my website. If one can overcome that perhaps there is hope for you too from your stroke and it's ill effects. My best wishes to you! I am doing better with my migraines thank you for ask I really appreciate that and I have no residual effects from my stroke thank God he brought me through it. I am doing much better all the way around. but I m willing to take my time and step by step learn all that I can from you and the others in this amazing community at WA! so thank you again and have a good week! You are so very welcome for the following and thank you for the follow back and I am sure that we can learn from each other because that is the whole idea and I also would like to welcome you in my network as well and you have a wonderful week. Best wishes on your success and on your journey with WA. Your faith is amazing. God lives, and is there to help you, as you are experiencing. Sometimes I only have to write out what I need and suddenly the answer will appear on the screen before me. It may be someone answering my question, or I just find the answer. It is wonderful to know that we are not alone! I am handicapped and have to work from home too and feel WA is the answer to my prayers too. May we all have success with the Lord's blessings. Thanks for following me. I am following you too. I checked out and saw what it was about and talked with my husband about it and he said that I could go and try it. Here we are a year later and still going strong. God is amazing always You are so very welcome for the follow and thank you for the follow back I really appreciate that so very much. I would love to visit your website. Would you please PM it to me? Yes, I will PM you with the URL address and you do the same. Yes, I would be glad to PM you with my URL address. A warm welcome and thanks for the follow I will do likewise. Thank you and you are welcome for the following and thank you for the follow back I really appreciate that. I have taken notes on the OEC training and I will be going back to Affiliate Bootcamp soon to start training again. I am just getting my feet rewet after being sick for the last 6 months so I am just starting off slowly not to overdo it. Best wishes on your journey with WA as well. A very special welcome to my network of followers. You have caused my network to reach the 400 mark. That is one of the many reasons to welcome you to my network. You will find that there are the greatest mentors you could imagine here to help you (us) to reach our goals. Plus you have a mighty helper in God who guides us along the pathway. Thank you for the welcome I really appreciate that I am so happy about that. I am happy to know that because I am be picking some brains for help and of course God we can never forget God. He is the most important one of all. Best wishes on your journey and endeavors with WA and blessings too. Dear Mary, I am sorry I missed everything I had to do a lot of work so I had money to keep my business goals in mind and plan to be successful with the help of my good friends at WA. No worries I understand right now I am not working because of my illness. I will be back soon to pick up where I left off at. Best wishes on your business and on your journey with WA. And God bless your family too. I wish you a quick recovery. I hope you feel better soon. I am going to have surgery next week so it might be a few days before I can get back to work. Thank you so much for your kind words and encouragement I really appreciate that. Best wishes on your surgery and I hope that you recover soon yourself. It is great to hear from you. Hope all is well, thank you, I am trying to juggle everything and learn a lot of new things it is exciting and I value our friendship. I am getting better from being sick for the last 6 months and I just came back to work so I am just getting my feet wet again. I understand about juggling things life does happen from time to time. I value our friendship too and you are a good friend. That sounds like you are having a technical problem with your site but I will take a look at it though and let you know. You are so very welcome for the following and I am glad to meet you as well. I am looking forward to reading about your successes as well. And you feel free to connect with me as well. Have a Very Happy Christmas and a Very Prosperous New Year Mary. Thanks for the follow. Right back atcha! Welcome to WA. I have no experience with this stuff either, but you will get help here!. Just ask if you get stuck. You will get responses. No one ever starts with "Hey Dummy". Believe me I know! I keep telling myself even turtles move forward! Best Wishes! You are so very welcome for the following and thank you for the follow back I really appreciate that so very much. Best wishes on your journey with WA. I am always here except for the holidays and if you need help don't hesitate to ask. Just be sure to take the training (do as I say, not as I do😁). I’m trying to do less commenting on sites and more taking my own advice. This site has all you need. Just take advantage of all that it has to offer! Best of luck to you. Yes, I am going to pick up training after the holidays. And I take notes on the videos so I have something to refer back to. And of course, I do ask questions when I am stuck. Yes, right now I am recuperating from a stroke so that is why I am going to pick up the training after the holidays I should be in better shape by then. Yes, and I am taking advantage of everything that is involved with WA. Best wishes on your journey with WA. Hi Mary and good to meet you. I read your bio and it inspired me to follow you. I’ve just joined WA in October and being a newbie in this business, I was impressed to see how high your ranking has become after only 8 months. You are obviously doing things right. Any advice you can give me would be very much appreciated. Welcome to WA and glad to have you apart of community/family. My advice to you is following the training step by step and take notes from the videos. As far as the rank goes, build up your network by following alot of people, participate in the community by answering questions if you can, helping other members when you can, talking in live chat, reading blogs and commenting on the blogs. And writing blogs for yourself. And if I can be of any help let me know and I will do my best to help you out. Best wishes on your journey with WA. Many thanks Mary for your kind offer of help and your advice for me going forward. I'm very keen to follow all the training and learn lots as I am very new to all this internet on-line business of affiliate marketing. Also many thanks for following me. Hi there Marmar thank you for the follow. Followed you back. Together with you this is all new to me too. With the overwhelming support offered in steps to take is wonderful. Hope and wishing the best for you. And good on you for not giving up on your success. God bless you keep you and strengthen you. 😊 Jo. You are so very welcome for the following and thank you for the follow back I really appreciate that. Just take your time to follow the training step by step and take notes on the videos. Best wishes on your journey with WA. Hi Marmar - thank you for following me. I have read your bio and noted that you joined in March this year. How are things going? I am giving WA another shot after joining 2 years ago and procrastinated so much about my niche that I gave up. I am now following the training step x step and feel that i am definitely in the right place here at WA. You are so very welcome for the following yes I joined in March I had two sales but I have two relink my site because I didn't have enough sales but It is going okay. That is good I am glad to hear that because you are in the right place. Best wishes on your journey with WA. Thanks for following me and joining my network; I've returned the compliment. I understand your feelings regarding "living paycheck to paycheck". I'm in the same club! I aim to change all that and I'm working had to improve my lot. I love Wealthy Affiliate and the things I've learnt. It's a great community spirit here. Thanks for your prayers. I'll say one for you too. You are so very welcome for the following and thank you for the follow I really appreciate that so very much. Yes, I am working on hard myself to correct that situation too. Yes, we have an awesome community here at WA. Thank you for the prayers I really appreciate that as well. Remember to take it easy one day at a time as for passing out business cards it certainly will not hurt it can only help. Thank you so much yes I am doing my exercises and they do tire me out but the therapist said that is normal so I keep plugging away at them. I am mostly resting and taking it easy and working here part-time that is why I thought about the business cards to help out a little bit. Thank you for your opinion I really appreciate that so very much. Thank you I am glad to be back even if it is just part-time for the time being. Hi Mary, thanks for the follow, I will now follow you back. I am like you as far as trying to get finances in order. Online seems like the best way to do it and WA helps a whole lot. I look forward to seeing your success and I wish you the best. You are welcome for the follow and thank you for the follow back. I look forward to seeing your successes as well. Best wishes on your journey with WA. Thank you for following me, it looks like you are progressing very nicely for being with WA for less than a year. I look forward to reading your posts I know I will learn plenty and I am excited to be able to join your network knowing you are praying for the WA community and your network. Thanks again! You are so very welcome for the following and thank you I have been working hard but that is only the half of it. Good, you can read my past posts if you like to give you a start anyway. I am so happy that you are happy being a part of my network. I am happy to have you. if you need any kind of help feel free to contact me by PM and I will help you to the best of my ability. You are very welcome my pleasure. I also look forward to working with you too. I have two sites myself and one is about pets and the other is the promotional site for WA. Please take a look at my site and tell me what you think about them. I would really appreciate that very much and thank you in advance for doing that for me. I, in turn, will take a look at yours. Hi Mama and thank you for the follow. I too am a Christian and it was my fervent prayers, asking the Lord to bring me some money to help make ends meet, that landed me here. I believe He will answer both of our prayers if we work hard and stay true to Him and ourselves. I hope you are having a wonderful journey so far and that you attain great success. I am happy to hear that you are a Christian. There are many Christians here and I am so happy about that. The Lord led me here so I joined WA. He left an email in my box and I opened it up and I joined after talking with my husband about it. So the rest is history. I am so glad that I joined WA. I am so glad and happy that I have met you. Yes, and my prayer is the same as yours to make ends meet and that we can live comfortable once again. I wish you the best on your journey with WA. if you need any help with anything PM me and I will help you the best I can. Thank you for the follow. You belong to a fantastic community of like-minded people at WA, so don't ever feel that you are alone on this strange journey that you are undertaking. If you have any questions or need somebody to talk to, you have so many friends here. Good luck for the future. You are so very welcome for the follow and we both belong to a fantastic community and it great. Yes, I have so many friends that help us along the way. Best wishes to you on your journey with WA. Thank you for following Marmar. The Almighty keep blessing you and yours. I'm learning this amazing journey at WA in the process of training and very grateful to God for knowing this Community that I'm part of it right now and willing to be part of your team. Thanks again. You are very welcome and yes he does keep blessing in ways that I never knew before. This is an amazing journey but we do it together. As the old saying goes there is no I in team so that means we are all in this journey together and that is what makes this community family. Welcome aboard and glad to have you. If there is anything that I can do to help you let me know and I will do my best to help you. I am wishing you a fast and complete recovery! Also I want to recommend to you a book that has been life-changing for me and my family: Dr. Joel Fuhrman's Eat to Live. It is probably the best book I have ever read - and I am so grateful I discovered this book (around 8 years ago or so). It's a world-wide best seller and is saving lives and improving quality of life for everyone who reads it and applies it in their lives. You can also Google Dr. Joel Fuhrman Youtube and watch some of his PBS (public broadcasting service in usa) presentations: powerful stuff! Take good care of yourself and get lots of rest, and I look forward to hearing about your complete recovery very soon. Thank you for your kind words and the advice I really appreciate that so much. I am grateful that it was not worse and I am counting it as a blessing and wake-up call for me to slow down and start thinking about me for a change. I am still going to take care of everybody else but the only difference is they come second now I am first. This was a scary thing to go through but I needed something to slow me down. But I am fine listening to my doctors, nurses, and therapists. Hi Mary, nice to hear from you. I look forward to getting to know you my new WA friend. Sorry about the delay in responding but I am a bit slow at the moment. Trying to do too many things at once. I noticed in one of your posts that you have some issue with spelling. If you want anyone to do a couple of proofs for you let me know. Helen, it is nice to meet you too. I am slow because I am just getting back to WA. I had another project to do and it is done except all the paperwork that accompanies it. I wrote a children's book and I am getting republish because the publisher I had messed me up and now I have to start over from scratch. I took last month off and now I am back getting all wet. I dive back in head first. I am working on my emails and then I am going to do some posts, and then I will blog. Hopefully, I can get this all done soon. We will have to keep in touch because I like to get to know my friends a lot better. Best wishes on your endeavors and on your journey with WA. Hi Mary! Thanks for the follow, I’ve returned the favor. 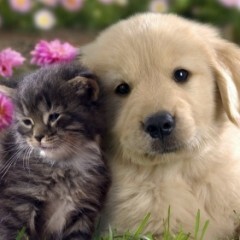 Love the animal picture! I have 2 cats and a dog, all rescues, and they all love each other, it is very sweet and their companionship is what helps me get through the rough times. You are very welcome for the follow and thank you for the follow back I really appreciate that. I have one dog and it is my husband service dog he was a rescue and we have two cats from a private owner. They are our children because they act like our children instead of pets. You are right they are best companions in the world to get you through the rough times. Best wishes on your endeavors and your journey with WA. Thank you for your kind words. Well I haven't made a sale yet and I realize it won't happen overnight but I have been here going on 4 months and nothing yet. I know that I have to be patient and I am working on that now. I have been quietly working on another project that needs my attention but I am still working on WA too. And thank you again for your kind words I really appreciate that. I visited your website. I see you moved it from a siterubix site to you own URL. Good move. You have one of the most popular niches. When editing your website, If you click on the picture you can choose to wrap your text around the picture. Gives you a much more professional layout. I would also categorize your posts. Your landing page appears to be your blog. I would add a paragraphy or two at the top which describes what you website is about. The block layout with links to the article is a good approach. I would add more information about the subject of each post. Be sure to key word optimize each post.. Use your keyword in each title and in the summary. That you for taking a look at my site I really appreciate that. I will try to do that about categorizing my post. The last time I try that it didn't work so I don't know if I did something wrong or not. I will do that about adding those paragraph on the first page. That you for the advice I really appreciate that so much. And thank you for the follow-on Google+ I really appreciate that I will follow you back just send me your address for it. My Social Media links including G+ are in my profile. Scroll down the right sidebar till you find them. Just click on my picture to get to my profile. If people here at WA realy want to connect with others here at WA they put the contact information in their profile. You can do what I described above for anyone here who interests you. It is important to develop a two way conversation with a few people you might want to work with. One way and we are talking at people. Two way and we are talking with people. Thank you for the follow, happy to follow back. Don't despair over no children I can send you mine. They come with clothes , shoes and medical insurance lmao. You'll have plenty if success and much more than your heart and hands can hold. You are so very welcome for the follow and thank you for the follow back. Thank you for your kind words but pets are my children sometimes worse than kids but they are my kids. Best wishes on your journey with WA. Thank you for the follow and happy to follow you back. I am new at this too and just wanted to tell you that you will need lots of patience and keep doing the training to succeed. This is a great online community here and they are always willing to help out when you get stuck. The support is also great! All the best and stick at it! You are so very welcome for the follow and thank you for following back. Welcome to WA yes you do need patience and absolutely you need the training to succeed. Yes, it is a great community here at WA. Best wishes on your journey with WA. Good evening Marmar463. The Lord has heard your prayers and he led you to find and joined. WA community to help you and your life for the better. What we need now is determination, discipline and desire to grow and earn online. Let's go and run with the group where you we can find all resources to excell now and in the future. Yes the Lord led me to WA and I am grateful for that and thank you for your kind words I really appreciate that. Well you sound a lot like me except the deep sea fishing. :) I have gone back to work outside of the home, but am hoping this will help until I can stop working. I also have been homeschooling my boys so it would be nice to get something that lets me work from home and earn money. I will keep you in my prayers as well to be successful with your efforts. I understand where you are coming from and you are right you and I are very much alike because of our circumstances. That will all change when we start making money with our own business. It will take time but it will happen. I will do the same and keep you in my prayers as well. Best wishes on your journey with WA. You are very welcome for the follow and thank you for following back We must all persevere if we want to succeed here at WA. I know that we can do this there is no question in my mind. Yes, we all will succeed in this business. Best wishes for your journey on WA. Thanks for the follow and it is great to meet you. You have much help here in WA and you are in the right place to learn. It is a great community and with a little hard work, you can succeed. And on that note, I wish you the very best in both health and wealth. Hi MM463 ! Thanks for the follow! I am now following you ! I am a new kid in the block here myself. But God does not care about ranks and knowledge. When and if He is ready to bless us in a big way, He just does it. Favor of God comes in many different strokes and ways. Not bad at all for being ranked 102 and one of the top 200 !!! Much luck and blessings to you here at WA ! You are so welcome for the follow and thank you for following back. Welcome to WA and best wishes to you on your journey with WA. You are right God will bless us in a big way when he is ready and not a moment sooner. And that is okay with me. And many blessing to you too. Thank you so much I really appreciate that being indexed is a big milestone and it is wonderful. You can do this business just be persistent, determine and very passionate about your niche and you can put in as much time as you like this is your business. Best wishes on your journey with WA. A very interesting bio of yours, I love pets like you and try to build my online business the right way, I have a question, how do you do to keep your rank down 150? I guess you might be very active to be able to keep it down, I had my rank once at 134, it seems whatever I do it goes up, probably not enough activity through the community. Any advice from you will be welcome. Thank you so much for taking a look at my bio I really appreciate that. I follow as many people as possible answer blogs and answer questions that I can. That is how I keep my rank down. Right now it is going back and forth up and down. I hope this helps you out. Marmar, glad to see you here. As far as I can tell, this place is full of awesomeness, and everyone is here to help you succeed. It is as legit as it gets. But you still have to do the hard work. With time, I think we all will be successful beyond our imaginations. Thank you for your kind words and I will definitely let you know if I need anything. I'm in the same "boat". I have a network of underemployed women who are housewives looking for supplemental income. Many of these women don't even have a computer, but they do crafts at home and I mentor them in their business. Mostly I'm a friend that supports their endeavors. I'm also a fan of "Murder TV". My fiance asks me why I watch it. I say it keeps my mind analytical and it mostly plays in the background on mute so I don't get distracted and start channeling surfing to find something to watch on TV if I'm bored. Since I joined Premium on WA I have so much to do I don't stay idle anymore looking for business opportunities to join because I'm so satisfied about what I have found here. Good luck with your business and I hope you find what you are looking for. I am looking to make a living to live comfortably and not have money worries anymore. Best wishes on your journey with WA and I hope you find what you are looking for. Comfortable living. I understand. I want prosperous living...freedom actually and flexibility. Full enjoyment. This is the closest i have come with WA. The dream is here. I can feel it so I'm reaching for it. That is a great image best wishes on your journey with WA. You are very welcome and best wishes to you on your journey with WA. Thank you for connecting . Mamar if you follow the training program that we have available to us , read as many times as needed and practice it by the time you finish you will know what it is necessary to start making money as an Affiliate Marketer. Listen and connect to people as much as you can, read the blogs and everything will come into place. Place your questions on Live chat and it is not clear enough reach one your 3334 friends they will try to help you -you're now a WA community member. You are very welcome, that is what I have been doing is going through the training again for the second time but this time taking notes on the videos. Thank you for your kind words and best wishes on your journey with WA too. Thank you for the advice too I really appreciate that too. I wanted to say Thank you for following me. I am following you as well. I really can appreciate your profile. I am also new to this and feel a bit clueless but with this community, I hope you find the success that you are striving for. Looking forward to networking with you. You are welcome for the follow and thank you for the following. The community is great we are here to help you succeed with help and encouragement. Best wishes in your endeavors in WA. And don't be afraid to ask questions that is what we are here for. Looking forward to working with you in this business. Allelulia! So grateful to have a fellow believer on board at W A. I also love Classical music and have been a member of a local Gospel Choir for about 7 years now. I have been trying to discover an authentic way to make money on line for a long time now. I really believe that this is the Genuine Article now. There is a lot to learn as I have discovered but keep pressing on. Although I am only in early stages of learning, if there is anything I can assist you with, please let me know, If I can't, there is always someone else more experienced who can. God Bless you. I am really grateful to meet other believers here in WA. I have met several other believers and I was surprised to how many believers there are here at WA. I will contact you if I need any help and you do the same. Hello Mary and Welcome To Wealthy Affiliate. Christians Can Make Money Christians Can Make Money Online You have decided to follow me and I will follow you as well. No probs Mary and if/when you read my blogs make sure you choose the ones that will help you in conjunction with whatever training you are currently taking. Thank you for the advice I really appreciate that very much. I am really done with my training but I am going over it again because I missed some of the information. I will definitely check out your blogs thank you I really appreciate that. Hi I am new to WA today. I am where you are as well tired of living pay check to pay check. I want a business that will be successful and I'm hoping to find it here. How long have you been in this program is it working for you? I am a Christian also so God is first and I believe he brought us to WA. Hang in there you will do just fine. Prayers to you and your family. First off welcome to WA. I know what you mean we are in the same boat. You will be successful here in WA just follow the training step by step and you will be fine. I have been with WA I have been with WA 1 1/2 month and my about me page was indexed with Google just waiting to be indexed completely. Have not made a sale yet but working on it every day. Yes he did because I have been looking for something to do at home and low and behold I found an email in my inbox and I opened and the rest is history. May God be with you and best wishes in your endeavors with WA. Thank you for the follow, my friend! : ) I have followed you right back. The Lord will guide you and help you as you venture into new beginnings! : ) Do not fear and do not give up ... even when it gets tough. If you have questions, please go to Live Chat and members will be happy to answer (myself included). Congratulations on deciding to work from home. That is a big step forward. a solid commitment. WA platform is the best I've worked with on the internet. We all need help from the WA community to be successful. They have been helping me along the way as I have undertaken the first steps of the certification training. I might add everyone has been very patient with me. I look forward to following to following you on your journey. I will not wish you good luck, you don't need it. Hard work is all it takes. Thank you for the kind words I greatly appreciate that so much. I am already working hard and I will continue to do that because it doesn't only take that but persistence and determination and since I have started with WA I have developed that. I would be very happy if you follow my progress along the way. That would also be greatly appreciated too. You are on a firm foundation. In Christ Jesus all the promises of God to you are "yes" and "Amen". That "Amen" means "be it so". As far as God is concerned you are successful in this business. Now, let patience have her perfect work that you may be perfect and complete, lacking nothing. Amen! Amen! you have to first understand what you are doing. That is the first achievement. I wish you much enjoyment in learning this business. In all the questions in the future we will get to know you. I am the queen of silly questions. I finally figure out what I am doing by going back over the training videos and they answer a lot of my questions. I am having fun and learning more and more about this business. You are welcome for the follow and thank you for following me back. Me too buddy, I am going back on lessons also. I believe it is easier to go back to the lessons because we miss so much information the first time around. Almost everyone who starts here begins with zero-experience in online marketing but become PROS. No worries. You are very welcome and thank you for the following in return. Yes, that is so true but then we have some that do have experience in this field. After a while yes we will become pros. Best wishes in endeavors with WA. You do the same get in touch anytime. Greetings in the name of our Lord. Thank you for adding me to your network. Following you right back. Like you story - tired of living paycheck to paycheck. I am on a quest to escape the 9-5 and hoping affiliate marketing will open the door for this to happen. Wishing you every blessing of success in your digital endeavors. You are welcome and thank you for following right back I really appreciate that very much. WA will open the door as long as we follow the training and learn from each other. Best wishes and God bless you in your endeavors with WA. Thanks for the follow, Marmar. Am a christian believer myself many years. One my niches is christian 'End Time' eschatology, ie., study of Biblical 'End Time' Prophecies. There is much error about this by many televangelists. I have the inside info. and, would like to create a website to expose it. You are welcome that is great we just did Revelations and it was interesting. I am working on a Christian website myself but it is not ready yet I am working on my other website right now. Good afternoon, Mary and thanks for adding me to your network. I have added you to mine as well. I also wan to welcome you to WA and mention that it's great to have another Believer as part of my group of followers. You are very welcome and thank you for adding me to your network. Yes, it is wonderful and awesome having another believer in WA. I have met so many Christians I remember all their names though. I hope and pray for success in your journey with WA, I look forward to connecting with you too. I loved your website, and I left a comment in. I congratulate you on your excellent and beneficial work. Keep up with it! You are awesome! Thank you for your kind words I really appreciate that so very much. Thank you for leaving a comment I really appreciate that so very much. I will get back to you asap. You always are welcome! Let's go ahead! Cheers, once more! I am sorry but I did not see your comment on my site. On what post did you leave the comment? Our great dog friends when passing away let us with a sad feeling of loss. Usually, this sensation is very hard to be overcome, because of the dog's love is some unconditional, not being this reached even among our most loves ones. I remember to have sometimes heard that the only fault in dogs resides in just believing too much in their human owners. Unhappily, it is a fact! Your website is very friendly and useful. Wish you great success in your work. You are awesome! I should say that even after posting the second feedback, I have not found it. I kindly ask you to check it, and if you desire, please let me know how to do to put it in again. I congratulate you for your excellent website and the helpful work you have been developing in that. Keep up with it! You rock! Cheers, once more! I thank you for your kind words and I will check on that for you no problem and I will get in touch with and let you know. Maybe you can try again I don't understand why it didn't take the comment. Anyway, I will check on it. Thank you, Carol, I really appreciate your kind words. Hello MarMar... Thanks for connecting with me and my network, as I will connect with you as a part of your network. I love the Lord and I was save by His grace. My older daughter just found out she doesn't have cancer... Praise the Lord! I find living within the day, one day at a time, as I have to remind myself, and to be as productive as I can, one day at a time, seems to make the road ahead to success more accessible. We all here, at Wealthy Affiliate help each other to succeed to help the ones we meet online to find what they are looking for or what they need. It starts with your passion of what you are writing content about, and it just seems to snowball into something you wouldn't even have thought it would be. The interaction with the community is awesome and it keeps me on track. Praise the Lord for your daughter. Thank you for your kind words I greatly appreciate that so very much. I have met different Christians here since I started a month ago. So I know this is what I am supposed to do. God led me to WA by putting it in my email and I opened it and the rest is history. And you are right about writing about your passion and that is what going to build your content up. We all have to remind ourselves to take it one day at a time. This will all happen in God's time and we can't rush that. It was a pleasure meeting you and God Bless you with your business endeavors with WA. And that is cool about your younger daughter being called MarMar too. I thought that I was the only one with that nickname but I am glad there is someone else with the same nickname. Hi Marmar, beautiful story of you, I am sure you will be very successful, everything takes time to achieve our goals, I see that you have already finished your certification training, that is wonderful! what is your niche, perhaps I could visit your website and leave a comment? 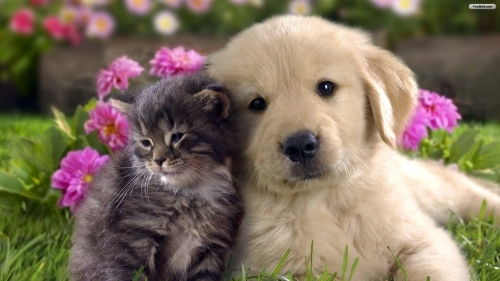 Pets are my niche my site address is at the bottom please visit my site I would enjoy getting a comment from you. I am working on my second site but not having much insight into it. I will have it up soon. I just have to some things over again because right now it does not make any sense. I am working hard to achieve those goals. I am happy that you enjoyed my bio. Best wishes in your endeavors with WA. Thanks for the follow Mary! My dog is my child also so I know the feeling. I’m new to this also so it’s a learning experience for us both; however, with God on our side how can we fail? Also, there’s a guy named Tony Hamilton AKA THE Marketing Veteran on here who offers free mentorship. He’s an ambassador on here so it seems like a great opportunity. You are welcome yes my dog and two cats are the children of the house. Yes, it is a learning experience because there is a lot of training at WA. Yes with God on our side we are not going to fail because that is not in our vocabulary. Yes Tony Hamilton is great I followed him and I suggest that you follow him too. We can learn a lot from Tony. I just read your profile and it just struck me straight to the heart that here is another lady in my exact shoes. I'm praying that you have great success here. I would so love to visit your website but don't know how to do that yet. I just joined yesterday the 6th of April. I'm so excited to learn all about Wealthy Affiliate. I can't offer you a lot of help at this point, but I do offer you friendship and encouragement. Down on the right side is my website address and I accept your friendship and encouragement. We can help each other out. I am praying for your success as well. You will learn a lot from WA and we can get help from other members through the community. Hi Mary, It was lovely to read your bio and learn a bit more about you. I will pray for your success. This is a great journey to be on and the support on Wealthy Affiliate is wonderful. My hobbies are sewing craft work, painting and gardening. Also love murder mysteries and music. Love the Gaither music and opera, well all music actually as it bring back happy memories when listening to it. I see we have something in common and that is awesome. I enjoy classical and opera music and I too love murder mysteries. And I listen to gospel music as well. You as well have a blessed day and I send you best wishes for your journey with WA. Hi Marmar, nice to meet you dear. Thanks for following back. I've read your profile and was acquainted. Yes we all have similar stories . But We have faith in WA programs when we're scammed by other internet gurus which disappointing at different occasions. Because in my own experience I've researched well and hold on to WA by the hand with many proofs and reviews by that I can firmly assure you that you're at the right place. Keep reading and watching certificate lessons and Kyle and Carson the co-founders can walk you through the most simplified step by step system . Yeah there's success at WA many people around the world have spoken. So be patient at first we all in the learning process. Thank you for the kind words I really appreciate that. I am learning the patience part and then I have the determination and persistence to proceed with what I have to do. And I have the faith this is what I am supposed to do. Hello. I just read a comment of yours and I can so relate with your effort at understanding Social Media. I am totally bewildered by Facebook that had lain dormant for several years, have forgotten my Twitter password and only signed up with Pinterest a year or so ago because I needed to look at pictures for a project my granddaughter was doing for school. But I have no idea how to use Pinterest except for looking at pictures. Anyway, I am going to follow you and wish you all the best. Thank you for the kind words I really appreciate that. I have made boards up with Pinterest I don't know what do with them. I figure it out and when I do I will let you know. We have a lot in common. My husband does well with his business buy works hard, long hours, and I would like to help him so we too, can stop living pay check to pay check. I am a Christian also, and feel this is what I am suppose to do in order to help financially, yet not disrupt our life. We LOVE gospel music, especially the modern country stars we listen to singing them. I feel God has led me to an awesome community where I can learn, get and give encouragement, and hopefully make money. It might take awhile to learn everything and make money, but in the long run it will be worth it! It will be worth it and if God didn't want us to do this, He would not have led us to this program and I thank Jesus for leading to this program. I just pray that I will make sales so I can do the same thing as you help financially. Thank you for the kind words I greatly appreciate it very much. You will learn everything you need to know from all the training we get from here. The community is awesome and I thank God for them. Welcome to WA, Mary and thank you for following me. To do this right, you do have to treat it like a job. However, you have a LOT of help between Kyle's training, Jay's webinars and the community. Just take it all step by step and you'll be fine. Thank you so much for your kind words. I will take it step by step and get through the training. Thanks for the follow, fellow Christian! You are going to love the WA community! I have been searching and searching on my own trying to figure out this online stuff. In one month with WA, I have created 4 websites! I'm mainly working on one but had ideas for 3 others so I created them and they will be on hold until I can work out the kinks in my original one. One of the websites will be a resource or directory of Christian-themed products and services. I just have to find the time to get to it. The best advice I can give you is to spend as much time as you can going through the certification first. Kyle's training on this site is excellent and if you ever have any questions or get stuck, do a live chat. Remember, I think a lot of us started as newbies with no clue so don't worry if you think it's a dumb question. I've asked my share of them - lol! Happy Easter and blessings to you. I can only encourage new members but there are so very many experts in this community that share their knowledge freely. If God has directed you to do this, He'll help you to succeed! I am glad to meet you. I have something to tell you. I have been looking for a work at home business but every time I would find something they wanted money. Money that I didn't have. Then one day I was going through my email and that is when WA came up. I came online and I have seen what it was about and started from there. I know God directed me to this so I know I have to try it out. I have started a second Christian website but I am trying to get the first one finished. When that one is done I will finish my second one then. I am so thankful and grateful to God. I have been with WA for three weeks now. Thank you for the kind words and needed to hear them. HI, Thanks for following me. May the Lord bless you with wisdom for the right niche and direction. As a Christian we often have an incorrect mindset about money and wealth. with the right mindset we can move forward and be successful. I pray that the Lord show you what is necessary for you to surpass your own goals and aspirations. Thank you so much and you are absolutely right. God brought this to my attention and I need to realize that he will provide that traffic to my site. As a Christian, myself leaning on the Lord is the best thing for me to now. I have met many Christian on here so far don't know the names (not good with names) but I know that I was meant to be here in WA. Keep me in prayer if you don"t mind I would greatly appreciate so much. Blessing to you in WA. Hello and welcome to WA. I have three cats and two dogs. They are my kids. I don't have children either. You came to the right place if you are looking to learn how to build your own website. The people here are very helpful. If there is anything I can do, let me know. Thanks for following me and I will follow you as well. A lot of people came in here first with that purpose of making extra money to supplement their current income. And like you, they're tired of living paycheck to paycheck. After following all the lessons here, and they took decisive action, and look where they're now? They're making full time income from home with Wealthy Affiliate! I am following the lessons and I have gone back to review them. Right now I am working on the social media sites trying to get them up and running. It's not easy but I am working hard to accomplish what I need to do. Best wishes in your business endeavors with WA. Good to hear that. If case you need help or you wanna ask questions, feel free to ask us here. Thank you, I appreciate that very much. I will do that. Thank you for connecting with me Marmar. I wish you much success. I am new at this as well and at times I feel like I am on shaky ground, but then I remember that my help comes from the one who sits high and looks low, first and foremost. Also remember that we have much support here in the Wealthy Affiliate community. I'm rooting for you! I know you're going to do just fine. Let's keep each other in prayer. Have a blessed day. Thank you for the kind words, I really appreciate that very much. Yes absolutely about keeping each other in prayer. You also will do just fine with the help of God. We are both going to succeed in this business. Best wishes in your endeavors with WA. Thank you Marmar. God bless you also. Thank you so very much, I greatly appreciated it very much. Best wishes in your business endeavors with WA. Hi, Mary. Not only do I welcome you to our fabulous community here at WA, but also thank you so much for adding me to your follow list! I have done the same for you in reciprocating your gracious show of support! Finally, I wish you all the very best in whichever online business venture that you will eventually choose to pursue here through WA! Thank you, Jeff, for your kind words. I greatly appreciate that very much thank you again. Best wishes in your business endeavors with WA. Hello Mary,♫Welcome! I am so pleased you found WA. Nice to meet you ツ I wish you a lot of learning pleasure and fun at WA. Thank you for adding me to your network. Thank you Mary for the follow and many blessings to you here at WA. As a Premium Member you are now in the process of creating content for your affiliate marketing website. Thank you I will watch that. I am trying to give help in my website and I hope and pray that I did. Maybe you can check it out and see what you about it. The URL is dogsandcatshome.siterubix.com I hope you like it. I just want to do good with it that's all. It looks like you are. Thank you appreciate your post. I just hope that my website is good enough to post and start making money online. Thank you once again for the vote of confidences I need it. You're welcome, Mary and thank you very much for your kind words. All of the members here at WAU have been a newbie at one time or another. Jump on the Get Started Here lessons, with both feet. Those lessons will be your guide through this growth process you are experiencing. Do not forget, you are not alone! While you are growing your new career do not forget to have fun! Thank you for vote of confidence because I have jump in with both feet and sometimes get overwhelm but I am learning. Thank you again. Its nice to meet you! Welcome to WA. It truly does offer the best learning platform for the newest of internet users. Combine the training with the knowledge of the community and there is no question that can't be answered. Thank you for adding me to your network. Here's to unlimited success! Thank you I am going to best to build a wonderful business. That will be with God ahead of the helm because I can't do anything without him. Thank you again I will ask questions. Thank you I will ask questions thank you I won't give up.